NYC, 02/06/2019, 6:00PM. 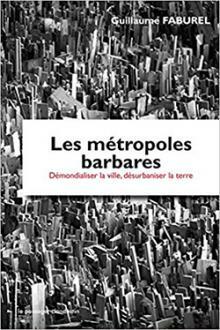 The Barbarity of the Metropolis: Towards a Biopolitics of Radical Social Transformation. Metropolization implies ceaseless urban expansion and an ever faster-paced life. It transforms towns into entrepreneurial firms and generates economic exclusion, spatial segregation, and social suffering, all while fueling the environmental crisis, to the point that large cities are increasingly rejecting it, evidenced by various forms of resistance. From a turn toward local farming as a source of food to the occupation of zones threatened by construction, these "alternative initiatives" and fights for the production of goods are the expression of a biopolitics of radical social transformation. To combine the organic totality of all that is alive, the living world's places and rhythms, and to collectively organize the conditions of autonomy could found the basis for a counter-society as a way out of the current socioecological abyss. Speaker Guillaume Faburel is a researcher specializing in urban studies and a professor at the Lyon School of Urban Anthropocene Studies. His work examines urban justice including environmental justice, metropolitan phenomena and urban lifestyles, as well as new forms of empowerment and citizenship.